Options Together™ Bible Study is a small-group Bible study tool that is beautifully filmed and expertly crafted to highlight the God-given dignity and voice of every person captured on film. The in-depth biblical content will help the user engage with the Lord’s mandate to care for the poor in the context of relationships, ridding us of the old giver/receiver narrative. Go to our store page. The seven lessons of Options Together™ are designed to help us understand the biblical call to engage American poverty in the context of Christ-centered relationships. These relationships can lead to mutual transformation. 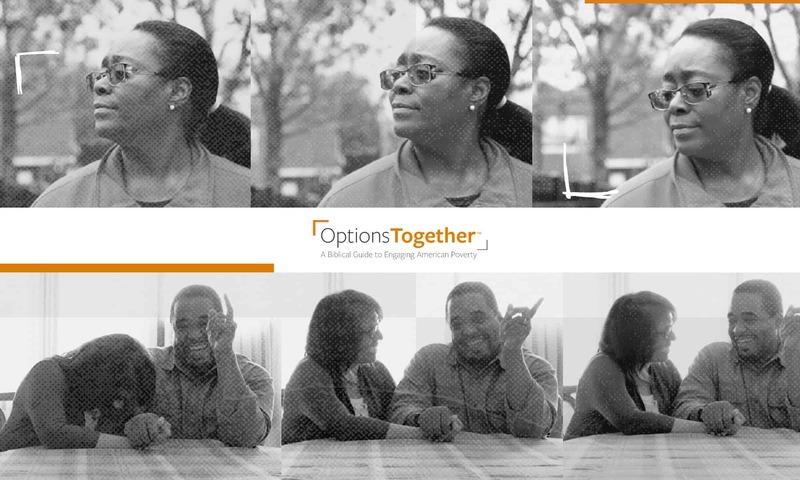 Options Together was filmed in five American cities with hundreds of hours of interviews, including experts and people who are living in circumstances of poverty. The narrative style videos will help you to see the inner city with fresh eyes, filled with the hope of gospel-driven transformation. The biblical content is both deep and wide. Meaning, the whole scope of scriptures are employed as well as deep dives into critical passages that will inform the way you see this issue for years to come. Options Together can be used to launch missions-minded churches, parachurch organizations, and individuals into our cities armed with the knowledge given by God’s Word and empowered with practical steps to engage in the sometimes difficult and complex environment of our inner cities. While there are hundreds of Bible studies on marriage and parenting, there are no video-based Bible study resources that will transport users into America’s inner city and allow them to hear from both the poor and experts alike. Module 1: Who are the poor? Module 2: Who is my neighbor? *Module 4 – The video story in this study describes difficult issues surrounding race, racial violence and sexual abuse. There are no graphic images but the content may be difficult for those who have experienced racism or sexual abuse. As a leader you should preview the video prior to showing it to your group. The Options Together store will be opening soon. Register here for more information and production updates. Where can I use Options Together™? Options Together can be used in a number of ways, giving you flexibility for your particular situation. You may wish to use this curriculum in a variety of environments, some ideas below. What if I don’t know much about poverty in America, can I still lead Options Together? Yes! Options Together is designed so that anyone, no matter the level of expertise, can facilitate a small group, a large group, or a personal study. Everything you need is in the Facilitator’s Guide and DVD. What if I have never lead a small or large group discussion? No problem. Options Together is designed so that you or anyone, no matter your experience or lack of it, can facilitate a small or large group or personal study. Everything you need is in Facilitator’s Guide and DVD. Is Options Together appropriate for high-school and/or middle-school students? Yes, we have worked hard to make this content approachable for everyone. Module 4 does contain sensitive topics around race and sexual abuse. Leaders are advised to preview this lesson prior to showing it to sensitive audiences. There are no graphic images, but the content may be difficult for those who have experienced racism or sexual abuse. As leader, you could preview the video prior to showing it to your group and pray about how to handle the topic with your students. Where do I get the Facilitator’s Guide and DVD? You can purchase the Options Together Facilitator’s Guide and DVD from the Options Together store . Where do I get Group Guides? You can download the Group Guides for Options Together for free on the Resource page of this website and print them yourself. If you prefer, you can purchase pre-printed Group Guides from the Options Together store. Are Group Guides free? Yes, you can download and print of as many Group Guides as you need at no cost. If you prefer to purchase pre-printed Group Guides you can purchase them from the Options Together store. Can I lead a group without the Facilitator’s Guide and DVD? It is not recommended that you lead a group without the Facilitator’s Guide and DVD. The content is built around both these critical resources. Module 7: What Do We Do Now? Download all the lessons in one PDF.